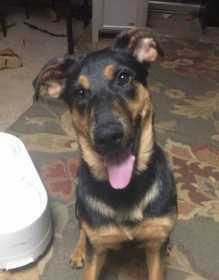 Momo is a German Shepherd / Rottweiler mix. She is 55 pounds, mostly black with tan spots on her belly, ears and paws. She is very friendly but somewhat shy, so she may not approach. We believe she was wearing her collar (turquoise blue) with a white tag and a QR code with her information linked to the website it brings up. We are extremely worried about her due to the cold weather, so PLEASE contact with any sightings.